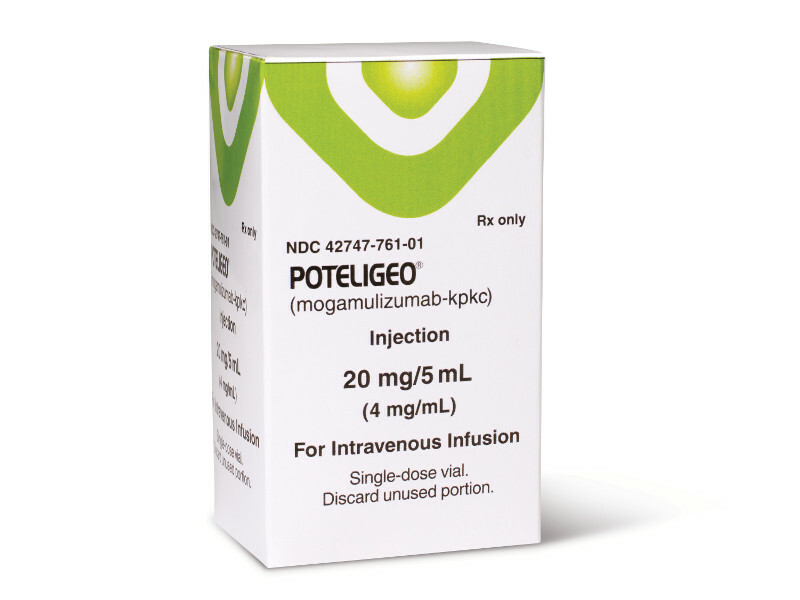 Poteligeo® (mogamulizumab-kpkc) is indicated for the treatment of mycosis fungoides and Sézary syndrome. Image courtesy of Kyowa Hakko Kirin. Mycosis fungoides and Sézary syndrome are two common types of cutaneous T-cell lymphoma (CTCL). Image courtesy of Kyowa Hakko Kirin. The most common symptom of the diseases is red rashes on the skin. Image courtesy of Kyowa Hakko Kirin. 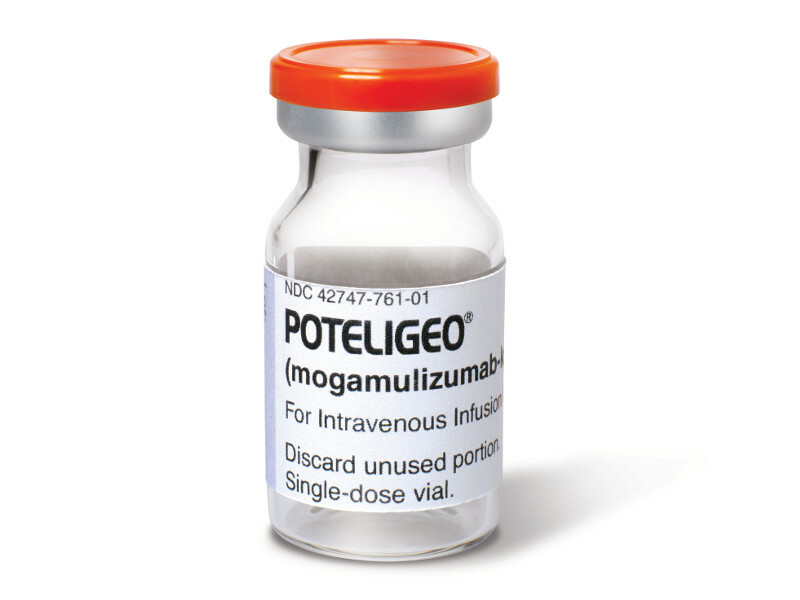 Poteligeo® (mogamulizumab-kpkc) is a monoclonal antibody (mAb) indicated for the treatment of mycosis fungoides and Sézary syndrome in adults. Developed by Japanese pharmaceutical company Kyowa Kirin, the drug was first approved by the Ministry of Health, Labour and Welfare in Japan for the treatment of C-C Motif Chemokine Receptor 4 (CCR4) positive adult T-cell lymphoma (ATL) in March 2012. It was further approved for the treatment of CCR4-positive peripheral T-cell lymphoma (PTCL) and cutaneous T-cell lymphoma (CTCL) in Japan in 2014. Poteligeo secured a breakthrough therapy designation from the US Food and Drug Administration (FDA) in August 2017. The FDA accepted a biologics licensing application (BLA) for the drug in November 2017. The drug was approved by the FDA in August 2018 for the treatment of adult patients with relapsed or refractory mycosis fungoides or Sézary syndrome after at least one prior systemic therapy. Poteligeo received approval for the treatment of mycosis fungoides and Sézary syndrome in Japan in the same month. 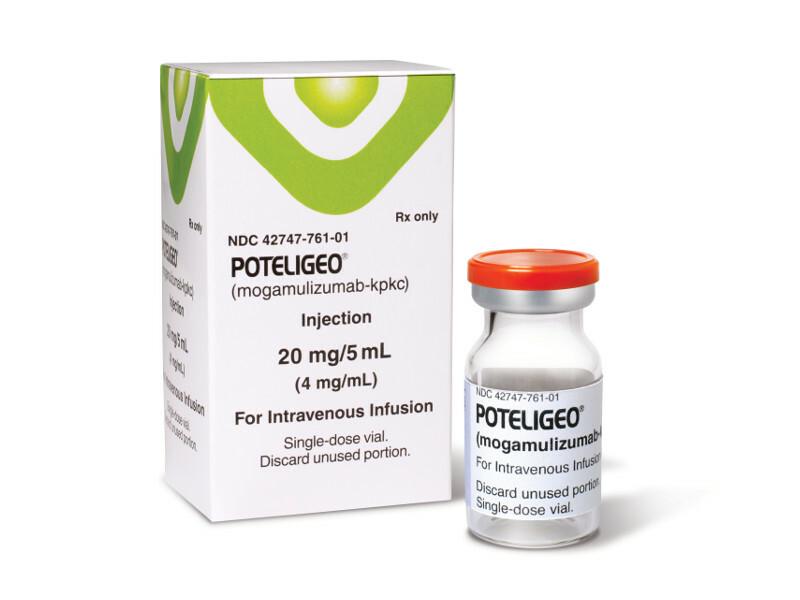 Poteligeo was approved by the European Commission (EC) in November 2018 for the treatment of adult patients with mycosis fungoides or Sézary syndrome who have received at least one prior systemic therapy. The drug is the first and only CCR4-targeting treatments to be available for patients in both the US and Europe. Mycosis fungoides and Sézary syndrome are two of the most common types of CTCL and a rare subtype of non-Hodgkin’s T-cell lymphoma. The conditions occur when T-cell lymphocytes in the skin become malignant and highly express the CCR4 antigen on their cell surface. Sézary syndrome is a more aggressive type of CTCL marked by the presence of significant malignant T-cell lymphocytes in the blood. A red rash consisting of either patches, plaques or skin tumours on the skin is the most common symptom of the disease, which may occur alongside itching, peeling and painful patches or tumours on the skin. Frequently, the blood can also be involved with malignant T cells circulating that move from the blood to the skin. Mycosis fungoides account for between 50% and 70% of cases of CTCL, whilst the more aggressive Sézary syndrome accounts for approximately 3% of all CTCL cases. Poteligeo is a humanised IgG1 kappa antibody directed against CC chemokine receptor 4 (CCR4), a G-protein coupled receptor that is overexpressed in the malignant cells of various blood cancers. The drug was developed by utilising Kyowa Kirin’s proprietary POTELLIGENT® technology to improve antibody-dependent cellular cytotoxicity (ADCC) in therapeutic antibodies. The technology reduces the fucose content in Poteligeo’s sugar chain structure, enhancing its ADCC. Poteligeo is available as a clear to slightly opalescent colourless solution in a single-dose glass vial. It is available at 20mg/5mL (4mg/mL) concentration for intravenous administration. The FDA’s approval of Poteligeo was based on the results of a randomised, Phase III, open-label, multi-centre, clinical trial named MAVORIC, which enrolled 372 patients. The safety and efficacy of Poteligeo were compared to vorinostat (Zolinza®). Patients were randomised at a 1:1 ratio to receive either Poteligeo or vorinostat. The primary endpoint of the study was progression-free survival (PFS). The patients that received Poteligeo demonstrated a median PFS of 7.6 months, while those on vorinostat showed a median PFS of 3.1 months. The confirmed overall response rate in patients treated with Poteligeo was 28%, compared to 5% in those treated with vorinostat. The most common adverse events noticed during the clinical trial were rashes on the skin, infusion-related reactions, diarrhoea, fatigue, musculoskeletal pain and infection in the respiratory tract.